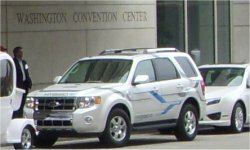 Old Car Memories > Commentary > 2009 Washington D.C. Auto Show – Green Confusion? The U.S. auto industry is on the ropes, and tough times are ahead. This also applies to European and Japanese automakers. With the shrinking U.S. economy and bad economic times appearing to be the likely course for the near future; all automakers will have a tough time selling cars. Though gasoline prices have dropped considerably since the high point of four and a half dollars last year, efficiency and improved gas mileage are being touted by all automakers as the goal for the future. This is to be expected with the tightening CAFE (Corporate Average Fuel Economy) standards right around the corner. Even though the standards have not been finalized yet, the common consensus is that 35 mpg (miles per gallon) will be the minimum average standard for both automobiles and SUVs/light trucks by 2020 (the standard could even be higher or if the automakers are really lucky it may be lower). The standards will within the next few years begin their ascent upward year-by-year until the expected 35 mpg standard is hit in 2020. 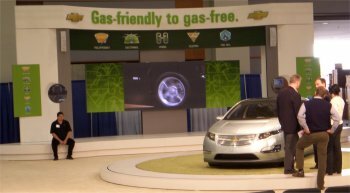 At the 2009 Washington D.C. Auto Show, automakers have jumped on the green bandwagon. Most automakers at this year’s show have as display centerpieces – hybrid, electric, and, alternative fuel vehicles. Some of these are current offerings, future offerings, and/or concept cars. Bob Dylan’s famous words – “the times they are a changing” certainly ring true. Chevrolet made its future green offerings a centerpiece of its display. 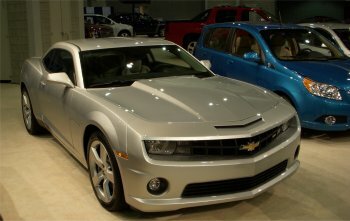 The new high-performance 2010 Camaro SS could be seen but was almost in hiding. Same could be said about the new 638 horsepower 2009 Corvette ZR1; it too was hidden away, situated next to a small flock of other 2009 Corvettes that were far from the main Chevrolet display platform. If this had been two years ago the return of the Camaro SS and Corvette ZR1 would have been the centerpieces of the Chevrolet display on glammed-up revolving pedestals. However their status was relegated to sitting on the carpet with all the other regular Chevrolets. Hopefully this is not a foreshadowing of future extinction for these ultra-performance cars that Chevrolet fans have waited a very long time to arrive. Getting back to the multitude of green technologies from the different automakers, I can’t help but think it’s circa 1900 all over again (when the automobile was just an infant). There are so many different emerging technologies and each automaker appears to be pushing towards different directions especially in the area of alternative fuels. For instance Toyota is continuing down the path of hybrids, which has proven to be an economically viable alternative to the traditional gasoline powered engine. GM, Ford, and Chrysler are examples of automakers that do make hybrids but are focusing on electric cars for the future and currently have working electric/battery-powered prototypes/concepts. Most are familiar with hybrids, the new cleaner burning diesel engines, and vehicles capable of running on both gasoline and (corn based ethanol) E85 fuels. However most are unfamiliar with all the different iterations of electric powered vehicles currently under development. Not to mention the different type of battery technologies being tested by different companies for use in future automobiles. And before you get too confused, there are also other cleaner burning fuels being tested by different automakers. Natural gas vehicles are currently being tested by some automakers in different markets. Another almost comical option being tested is bio-diesel fuel derived by such sources as used vegetable oil (used to cook french fries). Though it seems nobody (including the automakers) knows where the future is going, progress is being made. This writer had an opportunity to take a ride in two of Chrysler’s concept cars: the Dodge EV and Jeep EV (an electric powered Wrangler Unlimited). Both vehicles accelerated well and handled well. In fact the very lightweight attractive two-seater (sports car) Dodge EV (very similar in proportions to a Lotus Elise) produces 268 horsepower via an advanced lithium-ion battery pack. The Dodge EV accelerates from 0-60 mph in less than 5 seconds and does the ¼ mile in the low-13 second range. This exactly matches the performance of Dodge’s ultimate new muscle car the 425 horsepower (4,200 lbs.) 2009 Challenger SRT8. The one thing that is a surprise is how smooth and quiet the battery powerplant on the Dodge EV is. 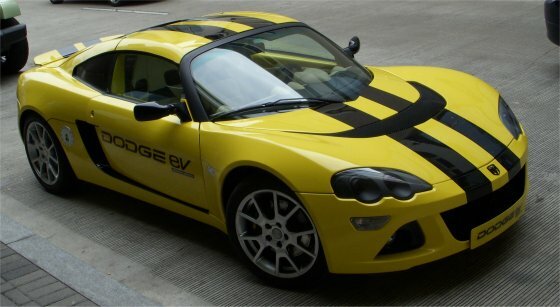 The Dodge EV is like a modern life-sized version of those electric slot cars you grew up with. The Jeep EV is the same way – its acceleration is zippy, smooth, and ultra quiet. It may weigh a lot more than the Dodge EV, but the Jeep EV offers real world capabilities the Dodge EV does not (the Jeep EV could easily fit the whole family in comfort). 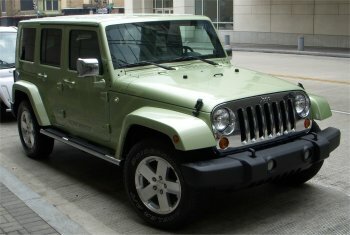 From the outside the Jeep EV looks like any other 2009 Wrangler Unlimited. On the inside the same is true. Only exception is the neat display of battery stats on a computer screen right where the radio normally is. The Jeep EV has the same 268 horsepower electric motor as the Dodge EV. So it comes as no surprise that this electric powered Wrangler performs better than any current or past production Wrangler. It accelerates from 0-60 mph in 9 seconds. But even more impressive is the 400 mile range (between recharging) of the Jeep EV which easily beats the range of the production 2009 Wrangler Unlimited. Where the Jeep EV falls short is it is only two wheel drive (a four wheel drive version is currently under development). After spending time in these Chrysler, LLC electric vehicles, I am actually quite impressed. The Dodge EV and Jeep EV are two vehicles that most consumers would be pleased to own and drive. Unfortunately there are still many unknown factors with battery-powered cars. For instance what type of range is deemed acceptable by the buying public? Nobody really knows the answer. And then there are other factors to consider the unexpected scenarios that pop up when you drive a battery powered car. For instance what happens when you run out battery power while driving? This will put a new spin on the walk to and from the nearest gas station with gas can in hand. Maybe the future is tow trucks with large battery packs for a quick charge? Maybe it’s a tow back to your house? Perhaps it’s an ultra long extension cord to plug into the nearest available power outlet? And nobody really knows what kind of stress electric cars will put on the power grid structure here in the United States. In an era where rolling blackouts from overtaxing of the U.S. power grid system are becoming more commonplace, it’s quite apparent that the power grid needs added capacity (more power plants). How long will this take? What type of power plants will be built? If these new power plants will be coal burning plants, it would defeat the whole purpose of going to a zero emissions electric/battery-powered car. One automaker – Ford – seems to be thinking ahead in this area. Ford is working closely with the Electric Power Research Institute to work out some of these future power related issues. But these are not the type of issues that will be resolved in the short term, it may take years. The move to hybrids and the possible future move to electric/battery-powered vehicles could cause the loss of more American jobs. Most of the current batteries used in hybrids are from Asia or Europe. However kudos must be given to Ford which has formed a recent partnership with Johnson Controls to make these types of batteries in the U.S. If battery powered cars hit mass production there may be some added costs of ownership. If the current hybrids are any indication, when battery replacement occurs the owner finds out real quick how the bill can be as high as $5,000 for the replacement battery and disposal fee for the old battery. Most late-model gasoline powered cars can easily rack up over 200,000 miles before an engine needs rebuilding or replacing. With battery powered cars and hybrids a battery will need to be replaced much sooner. The big question is – what technology is going to win out? Nobody really knows at this time. That’s what can be seen as clearly as daylight when viewing the green technologies showcased at this year’s Washington D.C. Auto Show. Ten years from now the future technology path may be set in stone. One thing’s for sure comparing the current technology to ten years ago – the auto industry has certainly come a long way however the road ahead is certain to be a bumpy one.